Merritt Island, just across the river from Titusville, FL, and in the shadows of NASA's Kennedy Space Center, is a great place to spend a day. Actually, you could have an awesome long weekend by staying in Titusville and visiting Titusville, NASA, and Merritt Island. As a city codependent on the space center, Titusville has had its ups and downs. She has finally grown up, gained some independence and become attractive for eco-tourism. Redfishing, windsurfing, kayaking, hiking, beaching, etc. Learning to navigate the delicate balance of nature and commerce, Titusville has a chance to change her image. I'm hoping she does. She's a great place to visit and could be so much more. 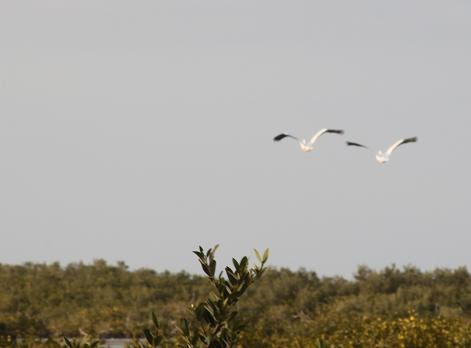 Beach - Canaveral National Seashore is part of Merritt Island. Drive up along the beach and pick your favorite place to spend a few hours on the beach. There are several parking areas along the shoreline. Many locals prefer Playalinda Beach. Hiking - Black Point hiking is a several mile hike, great views. The Hammock Trail is a short one, mostly the same view. Birding - I was there at the same time as the 16th Spacecoast Birding and Wildlife Festival, although that's not why I was in town. Merritt Island provides a perfect scrub jay habitat. 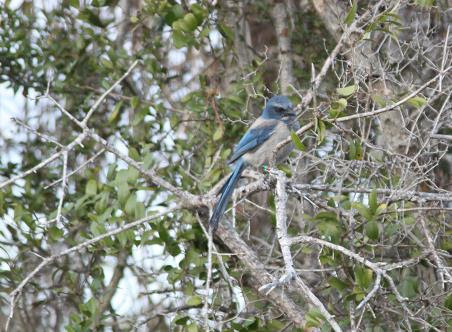 The scrub jay is native and endangered. I saw more than a few. The scout sits atop a tall tree at he highest point. If you see that, you'll find the family on the ground below, eating.